We believe your home is the very essence of who you are, your castle, your haven, the core and foundation of your family. Each home is unique and personal, filled with and because of, family traditions and beautiful things. You, our customer, are our most valuable asset. Your needs are most important with each decision we make, whether we're deciding on product lines, or ways of packaging for shipment. We welcome and encourage you to contact us with comments, suggestions, issues...especially issues...so we can learn and become better merchants. Since 1999, Hometraditions as strived to bring you the very things that inspire and cheer, things with good value and long lasting appeal. We know we can't do it all, but more then anything, we hope your experience shopping with us is the best it can possibly be. While Hometraditions is solely owned by Ann Pummell, there are various amazing individuals who provide products that make this company unique and very special. Dennis Bauer creates the fabulous feather trees. Amy Smith is the designer behind the sweet little Putz cardboard house kits. The beautiful Chalkware Santas and Rabbits are hand cast and painted by Diane Cheffy. Gail and Glenn Giaimo painstakingly design and assemble their one-of-a-kind Victorian Dresden ornaments. Betsy Moyer and Louann Edmiston are the creative designers of BetsyLou Pattern Company. Bonnie Wolfe is the incredible artist who designs our folkart pieces. Samantha Claus designs and assembles those gorgeous one-of-a-kind dresden scrap snowflake ornaments. And Ron Clancy is the publisher of the quintessential Christmas Carols and Music Collections, (the perfect gift at Christmas time). All of these artists reside in the USA. 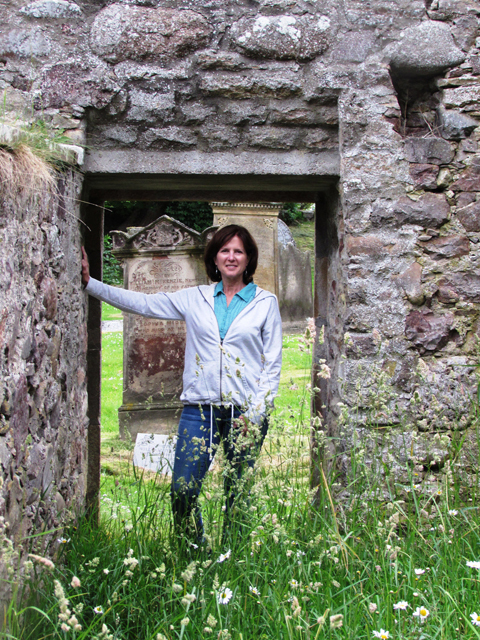 Side note: This picture was taken in Aberlour Scotland where my ancestors were ministers, and are buried.